I would not say that Cortney and I have been excellent role models of what faithful families should look like. In fact, I recently joked with a few people that it seemed like we had given up church for Lent. We had a string of weekends with sick kids, other plans, or both that kept us from our regular Sunday 10am worship, and in turn kept the kids away from their Sunday morning Children in Worship centers. We are usually regulars on Sunday, and if I am being truthful, I’ve left most of the “teaching” about our Christian faith to church: our pastors, the Children in Worship leaders, and the children’s message during church. I know that is not enough. That if we truly have this faith we say we have, it isn’t just on Sundays. While I firmly believe our actions and how we treat the earth and who and what are in it are really the mark of our Christianity, talking about it is important too, especially with our kids so they know why we do what we do. 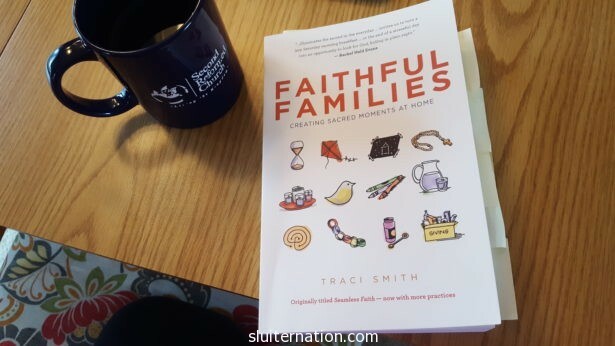 As I do with most things, I turned to a book given to me by a close friend: Faithful Families: Creating Sacred Moments At Home by Traci Smith. The book is divided into three categories: Traditions, Ceremonies, and Spiritual Practices. 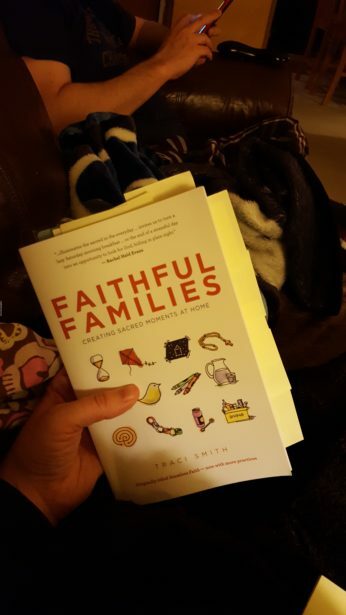 I went through the entire book in two sittings and put post-it notes on everything I thought would be a good fit for our family. As you can see above, I used a LOT of post-it notes! I marked the most practices in the Traditions section because I’m looking for ways to make our faith more a part of our every day lives. I like the way each practice is not just explained with a short narrative, but also is laid out in easy to follow steps. Then in the notes part, suggestions are given for making it more or less complex depending on the age of your children. One thing we have always struggled with is consistently praying as a family. At dinner the boys are pretty good at leading our family prayers, but at night we tend to read books and then just go to sleep. I didn’t want to start the kids reciting memorized rhymes for prayers because I remember just flying through them as a kid and not really thinking about what they meant. I also tried it with Ed when he was little and he got hung up on the “if I die before I wake” and was freaked out for quite some time. Practices in the book range from simple like a blessing, to more complex and deep ceremonies for things like pet loss, moving, and traumatic events in the news. There are small and large traditions for holidays such as Lent, Pentecost, Christmas, and even birthdays. Another practice I want to put in place is to somehow mark the changing of the colors of the church calendar. We talk about this a lot in church and I would like to carry that into our lives as well: green for Common Time, purple for Advent and Lent, white for Christmas and Easter, and red for Pentecost. I could just be a small area–a shelf or table–but I think it would help us remember growing/learning, waiting, and celebrating. That there is a time and season for everything. I am really looking forward to putting some of these suggestions into practice to help our kids know why we give and take care of others–that it’s part of our faith to be the hands and feet of Jesus. That our number one reason for being is to love. This is not a sponsored post. The link is not an affiliate one. The book was a gift and I loved it, so I wrote about it. Accept our gratitude, good Lord. Accept the gratitude we raise. Reflects the grace of heav’n above. Your life through theirs has hallowed ours. Today two saints stand out to me as being normal, every day people, who God used for the extraordinary, though I doubt either of them ever knew the impact of their lives on the lives of others. My Grandma Jo and my Father-in-Law Steve. Their strong faith and selfless nature created something in me that was unable to NOT believe. Because of their unwavering faith until the end, my faith never quite died out…even when I tried to extinguish the flame out of anger and grief. I’m no theologian or religion scholar. Shoot, we don’t even get to church every week due to one thing or another, so I am certain the things I say in this post will probably offend someone somewhere. Maybe even my own family. Maybe people will be disappointed in me after this…if I publish it at all. The thing is, faith and spirituality are very important to Cort and me. It’s something we have found ourselves discussing a lot lately. In fact, I remember a conversation he and I had over a decade ago…long before we ever knew we would be anything but friends…about faith. I was amazed that he “got me” and what I was trying to say without missing my point completely like most people do. I guess that should have been my first clue. But that is another post all together. Anyway, I have been thinking a lot about the power religion has over people and how personal it is. It amazes me how nothing can tear people apart and cause more hate and war and death than religion. Even though almost all religions are based on the idea of loving people and serving one another to honor God (or whatever name certain religions call him), people can somehow turn love into the most passionate hate on the planet and wipe out generations of people. If you have a belief it means you are confident in something that has no proof (or can’t be proven in the traditional, scientific sense). Right there. See? Some of you are feeling a bit huffy and getting on the defense because I said “there is no proof you are right”. But you feel right, right? You are SURE of it. You believe your beliefs. You have faith that they are the correct way to think and live. But it’s still a belief. Religion was created by humans to organize around a set shared beliefs. I have to be honest. I don’t know what I think about religion. I don’t feel like all these rules and interpretations and bickering about what God thinks is right is really what it’s all about. I don’t like the idea of being told a set of stories and passages and told to believe it, without questioning it too much. I don’t even really think I believe that heaven and hell are really places. I mean, I believe there is more to this life than what we see here in front of us. I believe in the soul’s of people; that we are different than other life on earth because of our souls; even that part of us lives on in the ones we love and in the world around us after we are gone. But I don’t really think, for instance, that my father-in-law is sitting on a cloud with a golden harp. Nor do I believe that there are people gnashing their teeth or tearing their clothing in hellfire either. I mean, maybe. But I don’t know. I don’t think it’s even my job to have to know. I mean, how can I know? Because the Bible tells me? That’s a whole other can of worms. The Bible. I read the Bible every day. I consider it the center of my faith. But do I think all the stories in there are historical and/or scientific fact? No. Do I think the lessons in the Bible are real. Heck yes. I just don’t take it all literally. But I take it spiritually. I learn how to love from it. There are some people who are shaking their heads and sure that now I am going to hell because I don’t really believe the way I am supposed to. But I don’t feel like my relationship with God is less because of my doubts or questions. Could I be wrong? Yup. Could I be right? Maybe. But that is my point. No one can no for sure. I think it’s human to doubt and question and ebb and flow in our faith and beliefs. I think that is natural. I am confident in my belief that whatever doubts or questions I am having, it’s Ok. God is Ok with me just like I am when Eddie comes to me with questions and doubts. God is a patient Father who listens to my worries and doubts and lets me in on what I need to be in on and nothing further. Just like I don’t tell Eddie all the details of our budget, I assure him daddy and mommy can provide food and a house for him and his brother. We communicate. And that is what I do with God. I tell God when I don’t get something. I tell him when something in the Bible contradicts something else in there that I read. I mean, I know he knows. While we are told God is the author of the Bible, that isn’t entirely true. He inspired the humans who wrote the letters and prophesies and pieces that are included. He inspired millions of other people’s writings that were never included, nor have been included since it was first put together. Humans put that book together and called it God’s Word. When something doesn’t make sense to me, like why would God kill all the innocent first born male Egyptian children before he rescued the Jewish people from Pharaoh? They weren’t the sinners. I mean, if God killed Eddie to punish me, yes it would horribly punish me. I would want to die too, but isn’t there something he could do to me and not my innocent child? And then did those Egyptian children get to go to Heaven? It wasn’t their fault they weren’t Jewish and born before Jesus came to save the world. Or did they hang out in hell until Jesus died, went to hell, and came back? And I don’t believe that God does this to people. I don’t believe the bad in the world comes from Him. So why did it then? These are the things that I think about when someone posts something in my facebook feed that informs me that Easter is evil because of the pagan beginnings, despite the fact that Christians don’t actually celebrate the pagan stuff. When someone gets so very wrapped up in rules and “laws” and they seem to lose the idea of love, forgiveness, and salvation. When someone seems to be living their life worried about what something is called instead of living for the actual thing. When someone claims they are righteous and able to judge others because that is what “God tells them to do”. I don’t think I have the right to tell you what I believe about your fate based on what I think your beliefs are, and I sure as heck don’t want people doing that to me. In fact, I don’t think I have a right to make any judgement call on your fate nor you on mine. Yet there are still people who will read this and choose to “save” me from all this doubt. But I am Ok with the doubt. I am solid in my relationship with Christ. After 35 years of being around Christianity, for the first time in my life I feel like I’ve got a solid foundation with God. Even though I have more questions than I ever had before. I don’t think I’ll ever know the answers to a lot of those questions. But that is where faith takes over. Even though it can’t be proven, I just have faith. There are plenty of things I could point to that I can see, “see that? That is part of why I have this faith,” but I’m not going to. This post is far to long as it is, but because the words wouldn’t stop bumping me behind the eyes, they had to come out. My faith is messy, but it’s my messy faith. And it makes me happy and gives me hope in this world that is so very full of hurt and hopelessness.